Base price is for a rental period of up to 8 hours. 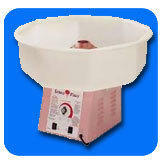 Our commercial cotton candy machine is perfect for school and church events. One 20amp outlet with nothing else running on it is reequired within 75 feet. No supplies are included with machine, but are available at an additional cost.